What is courage and why is it one of the oldest and most universally admired virtues? How is it relevant in the world today, and what contemporary forms does it take? 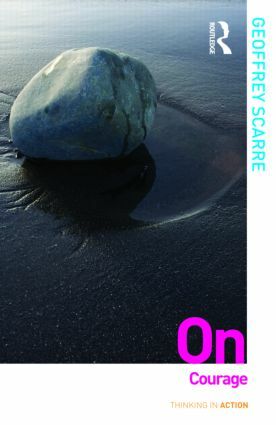 In this insightful and crisply written book, Geoffrey Scarre examines these questions and many more. He begins by defining courage, asking how it differs from fearlessness, recklessness and fortitude, and why people are often more willing to ascribe it to others than to avow it for themselves. He also asks whether courage can serve bad ends as well as good, and whether it can sometimes promote confrontation over compromise and dialogue. On Courage explores the ideas of Aristotle, Aquinas and many later philosophers who have written about courage, as well as drawing on classic and recent examples of courage in politics and fiction, including the German anti-Nazi "White Rose Movement", the modern phenomenon of "whistle-blowing", and Stephen Crane’s The Red Badge of Courage. Thinking in Action is a major series that takes philosophy to its public. Each book in the series is written by a major international philosopher or thinker, engages with an important contemporary topic, and is clearly and accessibly written. The series informs and sharpens debate on topics as wide ranging as the internet, religion, the problem of immigration and refugees and the way we think about science. Punchy, short, and stimulating, Thinking in Action is an indispensable series of books for anyone who wants to think seriously about major issues confronting us today.